Reflective warning tape, play a warning and reminder role in your daily life. Reflective tape is a kind of light can reflective in the dark and the night. mainly for road transport installations and snooze, vehicles, boats, fairways, a stage, a wide range of channels, and mechanical equipment. Reflective film can clearly outline the contours of the car body, helping to identify the vehicle type, size, and avoid accident happen. Size: 5 cm x 3 m/ 0.16 x 9.84 ft. These reflective tapes are made for safety concern, to warn and remind in special places. Honeycomb-style patterning tapes have strong reflectivity. Tapes are adhesive, easy application to smooth surfaces, sticky enough to remain for a long time, water-resistant and moisture-resistant, not easy to fall off. Could be as a wristband, Armband, also can be use for pants, jackets, pet clothes, wall or floor ect. 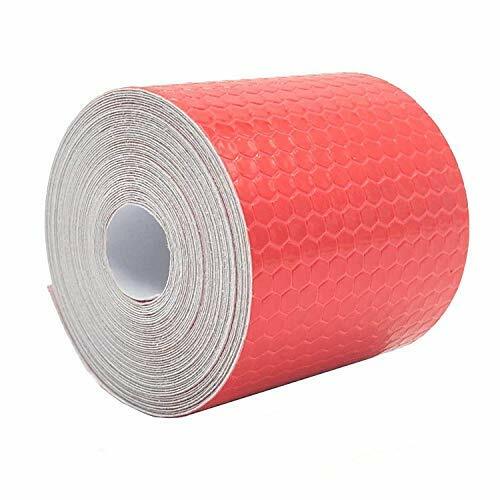 Plays a warning and reminder roll, suitable for trucks, motorcycles, cars, trucks, body reflective film can clearly outline the contours of the body and helps to identify the vehicle type, size and avoid accident. If you have any questions about this product by Shinequ-US, contact us by completing and submitting the form below. If you are looking for a specif part number, please include it with your message.